Rain. Rain. Go away. Come again on Monday. Our original plan was to hop over to one of the islands near Mokpo (Hongdo and Heuksando) but the weather wasn’t cooperating, and we underestimated the time. One piece of advice: if you want to head over to the islands, I would give yourself more than a weekend to do it. I talked to a couple of people who’ve been, and they’ve said its an amazing experience, but in most cases, its at least a day trip, if not overnight. Next time, we are in Mokpo, we are going to give ourselves a few more days and make the trip. However, since we both are museum buffs, and Korea has excellent museums, we decided to head over to the National Maritime Museum, and conveniently, the Mokpo National History Museum. 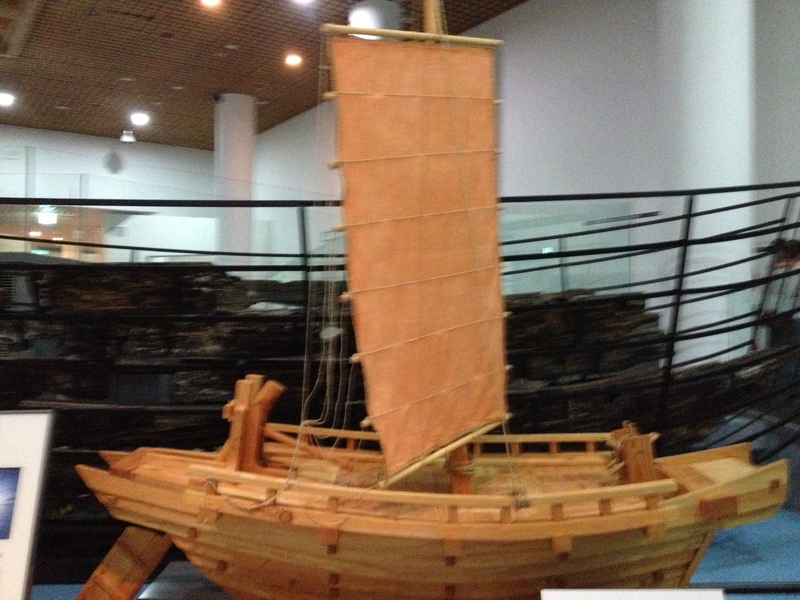 Lonely Planet’s Description: This is the only museum in Korea dedicated to the country’s maritime history. The highlights are two shipwrecks, one dating from the 11th century and the other from the early 14th century. Thousands of priceless items of Korean and Chinese celadon, coins and other trade items were salvaged from them. Fascinating film footage shows the treasure being salvaged, and part of the actual boats has been preserved. It has excellent English signage. How to get there: My deepest apologies if you are a public transportation enthusiast, but when the rain was pouring down, standing at a desolate bus stop, not completely sure how to get there, was about as appealing as visiting a porcupine petting zoo. So we just decided to wave down a taxi and showed him the description on page 221. If you don’t have the luxury of having this inspiring guidebook, just show this: 국립 해양 박물관 to the driver and he’ll get you where you need to go. Why Should I Go There: First thing that stood out to me was the layout of the museum, which had lots of open space. Walking into the museum was like walking into an ancient Greek foyer. On the right was a small gift shop, and on the left was a place you could put your coats, and the entrance into the museum. Although you are free to walk around the museum at your own discretion, it is suggested you start from the left and work your way around. The Lonely Planet was accurate about the artifacts and the recovery of ancient aquatic vessels. The museum is basically divided into four sections: The Wando Room, The Sinsa Room, The Fishing Village Folk Room and the Ship Room. Now, unfortunately, I lost the map which shows the layout of the museum (Doh! ), so I’m going to do my best to recall from memory. If there are any mistakes, please feel free to comment and I’ll make the correction. The Sinsa Room: The Sinsa room contains the wreckage of a Chinese shipping vessel which sunk near Sinsa in 1323, en route to Japan. This is an amazing display of reconstruction, and although it is not nearly complete, the preservation of the ship is remarkable. Fishing Village Folk Room: We went through there briefly, and there were some interesting displays, mainly tools used by fishermen from long ago. Sorry, no photos this time. 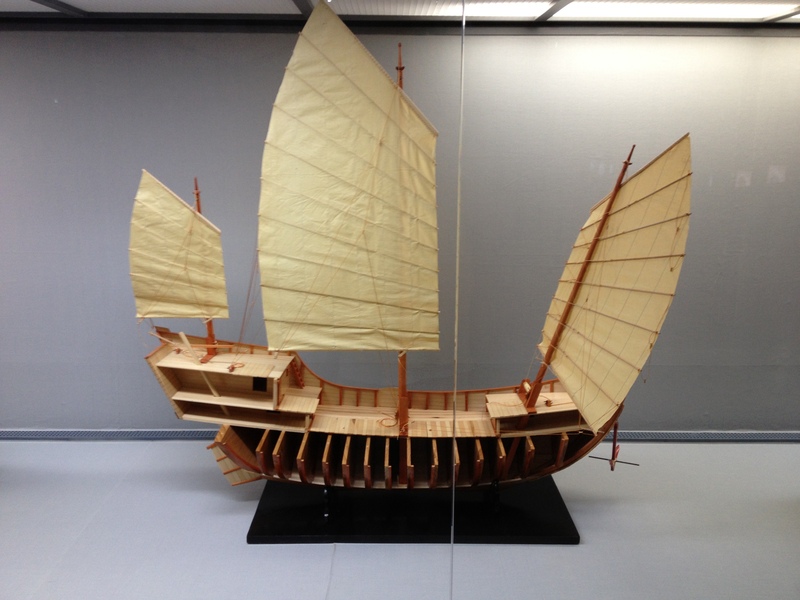 Ship Room: Lots of interesting historical models of Korea ships; including my personal favorite: the mighty turtle boat! Yi Sun-Shin would be so proud! Miscellaneous: There is also an outdoor exhibition hall which displays anchors, Korean vessels and fishing nets. We didn’t check this out because of the rain. Also, there is a movie room which shows the excavation of the Sinsa ship, however it is all in Korean. It is still interesting to watch though if you want to see the actual techniques they used to excavate the wreckage. The gift shop was small, but some interesting gifts. My wife and I bought some 3D puzzles of the turtle boats. There is coffee shop in the museum, but when we went, it appeared to be closed; or it is possible the adjuma running the gift shop also doubled as the coffee server? I don’t really know. Who should visit there: My wife and I are museum junkies, so naturally if we can’t be outside, we are going to head to a museum. I would recommend it to anyone who wants to kill an hour or so, and learn about Korean history in an air-conditioned environment. I don’t know if I would recommend this for children, especially children who can’t speak Korean. The artifacts are interesting, but the interaction is limited. As well, I don’t know too many children who are interested in Asian nautical history. However, an alternative is to check out the Mokpo Natural History Museum across the street, which has more interesting exhibitions such as dinosaurs and animals that might interest the fruits of your loins a little more. Questions? Comments? Feedback? You know what to do. This site is dedicated to following the Lonely Planet series of guidebooks and is not affiliated with Lonely Planet publications.